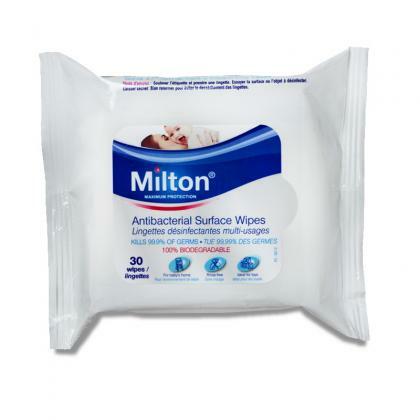 The Milton brand and products have become synonymous with protecting babies and families for over 65 years from harmful germs with their range of eco-friendly hygiene and skincare products for all ages. Up until the age of 12 months, a baby’s immune system is weaker and more vulnerable to catching infections which is why sterilising is incredibly important. 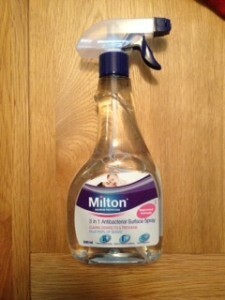 Back in the 60’s and 70’s my mum used Milton with my brother and I and so I’ve kept it in the family and chose to use the traditional cold water method and own a Milton sterilising 5 litre unit. 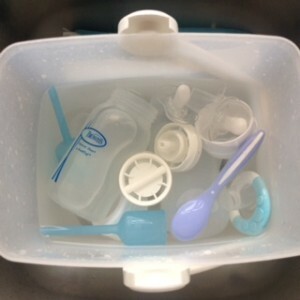 It’s great for holding bottles, baby feeding accessories, teething rings, small plastic toys, plastic cutlery, and I’ve found this method has worked well. I don’t own a microwave (yes shock horror and haven’t for years!) 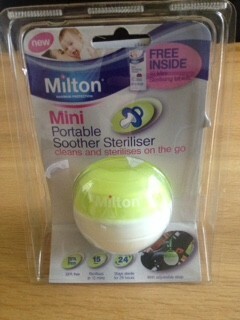 but the unit is large enough to hold lots of items and sterilises in 15 minutes with Milton Sterilising Tablets or Fluid. 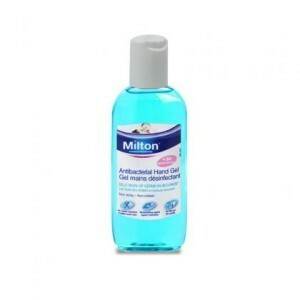 I’m not so keen on the chemical sterilising smell if I’m totally honest but it’s a no fuss process and the unit is portable which has been really handy. 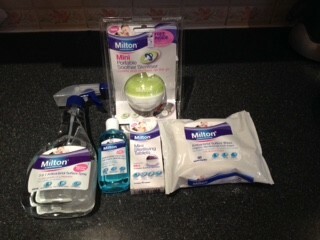 I recently got to try some Milton products which I haven’t used before and to my great surprise loved the smell! The 3 in 1 Antibacterial Surface Spray disinfectants all surfaces I keep mine in the kitchen but it can be used for cleaning baby’s bath or potty too! 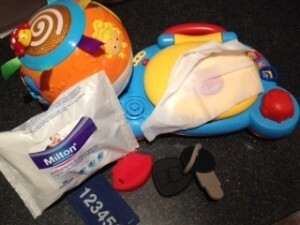 Jay is teething and is constantly putting things into his mouth so I have been cleaning his toys daily (sigh) but it’s not too cumbersome as I am now using the Antibacterial Surface Wipes which kill bacteria and fragrance free. This Antibacterial Hand Gel lives in my changing bag for use when I’m on the go but I also keep one at Jay’s nappy station and it leaves hands feeling clean with no stickiness, it smells gorgeous too and does what it says on the bottle. The Mini Portable Soother Steraliser is an award winning product and allows you to always have one soother ready whenever you need it with no need to rinse using the Mini Steralising tablets. Jay isn’t so keen on soothers these days but I carry one with me just in case he decides to go into meltdown mode. *I was sent some Milton products to review and all opinions are my own.